During yesterdays anti-fascist demonstration in Barcelona, Catalonia, fascists again and again provoked the demonstration and threatened anti-fascists. 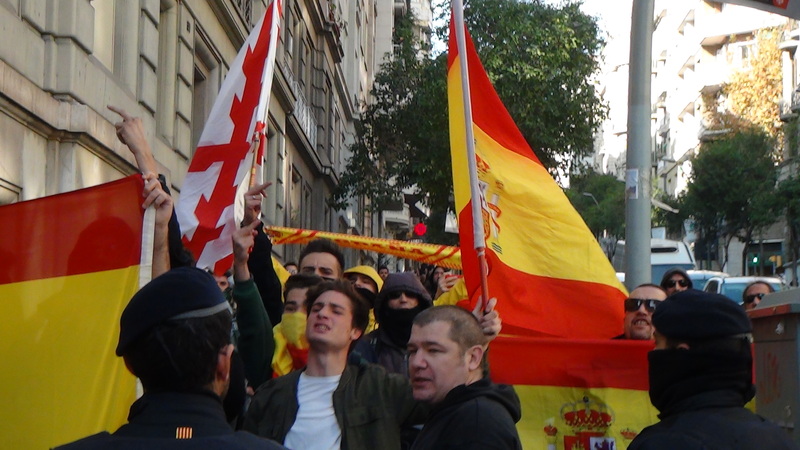 The demonstration against the increasing number of violent fascist attacks on the Catalan territory was applauded by some neighbours, others joined the demonstration. Image: Fascist provocating the anti-fascist demonstration in Barcelona on November 18. Published by Enough is Enough. We arrived early at the starting point of yesterdays anti-fascist demonstration in Barcelona. One of the first thing we noticed on the Via Augusta was the large amount of fascist stickers and Spanish national flags hanging on balconies. About 15 minutes before the anti-fascist demonstration started a group of about 200 Spanish nationalists and fascists marched on the Via Augusta. Some of the fascists were masked. About 300 meters before the starting point of the anti-fascist demonstration the Spanish nationalists and fascists were stopped by Catalan cops. At 12:00pm the antifascist gathering started. As people started to march a group of fascists appeared on a side street of the Via Augusta and tried to get to the back of the anti-fascist demonstration. Catalan cops stopped the fascists and although the anti-fascists outnumbered the fascists this seemed to be necessary. The anti-fascist demonstration continued their march on the long Via Augusta and the fascists walked on a parallel street, appearing again and again in side streets. The cops got more and more nervous and blocked the fascists. The cat and mouse game between the cops and the fascists lasted for some time but suddenly the fascists dissapeared. We don’t know if they dispersed or the cops had enough and stopped them on the parallel street where they were walking. The anti-fascist demonstration marched to the Diagonal subway station. Many refugees and migrants participated and this could be the reason that the demo chanted against the fascist provocations and the fascist attacks in the past weeks but did not stop the fascist provocations. Its always difficult to stop fascists with direct actions when there are people on your demonstration that might not have documents. But for us it was also difficult to accept that people decided to leave that job to the cops. All in all the fascist provocations showed that the fascists are getting more and more active. As a comrade said during an interview we recorded a few hours later; “The fascists were always there. Its nothing new. But they are very active again.” At the moment we are filming a documentary about the situation in Catalonia. The interview will be part of that documentary. Our equipment suffered a lot from traveling around Europe for our independent on the ground reports. We need new microphones for better audio on our video reports, a new laptop (the last one crashed in Catalonia) and have a lot of expenses for our on the ground reporting. We want to stay independent and want to expand our work with on the ground reporting across Europe and even beyond. Therefore we need your support. Help maintain our site and continue our work. Your donations make our work possible. On November 15 a few people of the Enough is Enough team will travel to Catalonia again to continue their work on a documentary about the current situation there. On December 17 we will travel to Lesvos (Greece) and in January we will travel from Lesvos to Athens to report on the ground. Each donation helps, also the small ones. Thank you for supporting our project. Next post: #RefugeesGR Protests on #Lesvos Continue: #OpenTheIslands!